I thought the sky was falling and the Lakers sucked? Oh I guess they aren’t that bad because they’ve won 3 in a row and are creeping up on the top seed in the Western Conference. If you’re complaining it’s because you have no perspective. The Lakers are right where they should be, they are improving, as are their young players. 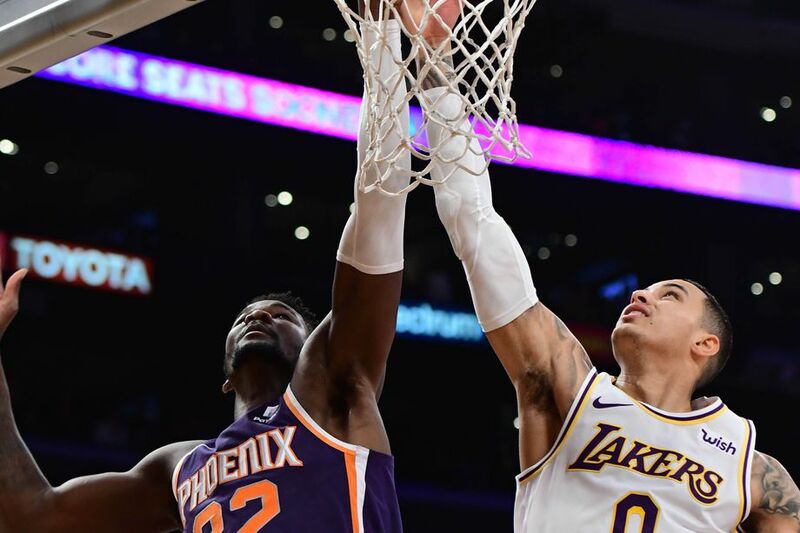 Kyle Kuzma is solid, Brandon Ingram is getting better, and Lonzo Ball is doing more than you think. However, Mo Wagner looks like a fan that stole a jersey and somehow got on the court for playing time. The real question is how they take the next step. They need to sign one max free agent this summer and trade for another star, like Anthony Davis. Don’t tell me they should trade everybody for Bradley Beal, because you won’t win any titles with him as your second best player. My head also tells me that KD, Klay, and Kawhi aren’t going anywhere, but when i listen to Magic talk, he sounds convinced one of those guys are coming. I believe in Magic and so should you. Meanwhile, you’ve gotta give the Clippers credit. Nobody thought they would be anywhere near the top of the Western Conference without having a star player. Frankly, most of us thought Doc Rivers became a bum as a head coach. However, Shai-Gilegous Alexander can actually play, and the team doesn’t actually hate each others guts anymore. I’m still not convinced free agents actually want to come play for the Clips, but they are much more interesting than we thought. The only problem for them is that their 1st round pick is lottery protected, so they are much better off missing the playoffs. To the NFL where the Rams got a gift from the football gods with the Saints losing on Thursday night, allowing them to reclaim the best record in the NFC with yesterday’s win over the Lions. They also clinched the NFC West title for the 2nd year in a row. Aaron Donald should probably get MVP votes, but because the voters have no idea what a Defensive End is, but he probably will be completely ignored like that girl you didn’t want to go to Prom with in high school. Next week makes me really nervous though. The Bears seem very capable of knocking off the Rams in cold weather. In any case, Todd Gurley doesn’t give a crap about your fantasy team. Monster win for the Chargers. if only anyone cared. It would have been very “Charger-esque” of the Bolts to lose the game yesterday on a couple of missed field goals with the game on the line. I’ve seen better officiating in bar brawls. The Chargers benefited from the officials, and now might even get themselves a first round bye if things break right for them. In any case, it’s safe to say that home field doesn’t mean a damn thing for them, since they have no fans that show up to their games and cheer for them. Perhaps if Philip Rivers brings all of his kids to the game, he might be able to fill up the stands. Elsewhere around the NFL, it doesn’t matter if it’s Kareem Hunt or Hunt’s Ketchup, the Chiefs keep winning. The Packers lost, but Aaron Rodgers was seen popping champagne in the locker room after the game when he learned that Mike McCarthy was fired. I have no idea why Bill Belichick was yelling at Adam Thielan. He’s white and he’s a good receiver, which means he’ll be on the Patriots in the next year or two. Joe Flacco might never get to play again after the Ravens beat the Falcons. Since it’s the holiday season, Cam Newton is obviously in a generous mood throwing 4 interceptions in the Panthers loss to the Bucs. Meanwhile, every Cowboys fan has already booked their trip to the Super Bowl after they beat the Saints. I feel like Cliff Kingsbury is just trolling every major college and NFL team at this point, just so he can get free dinners from them. Everybody wants to hire him as their offensive coordinator. If USC is able to hire him, I’d be very impressed. It looked like that was going to happen, then for some reason Kingsbury got cold feet. He probably realized that he has competition with Sean McVay for the most handsome football coach in LA, and just couldn’t take it. I think it’s safe to say Kingsbury is going to make or break the Trojans offseason. We’ll find out within a couple of days if he’s coming. To baseball where the Dodgers and Indians keep talking about a big trade. That proposed trade would involve pitcher Corey Kluber going to the Dodgers, with Yasiel Puig, Joc Pederson, and top prospect Yadier Alvarez going to Cleveland. Kluber is a nice pitcher and all, but this is so typical of Andrew Friedman. He’s the kind of guy who learns that his house needs a new roof, and instead he decides to remodel his kitchen. The Dodgers need bullpen help, not starting pitching. Instead, Friedman is leaning on unproven and untalented arms he hopes will miraculously come through out of the pen. Sadly, there is plenty of bullpen talent on the market that can help. Finally, the Angels badly need to make some moves. Mike Trout is two years away from free agency, they now have decent prospects in their system, and they can take on some money. The Halos need to call the Giants about Madison Bumgarner, and the Mets about Noah Syndergaard or Jacob DeGrom. They badly need pitching, and it’s only going to come via the trade market. Of course knowing the Angels’ luck, Garrett Richards will win the 2020 Cy Young award after he just signed a 2-year deal with the Padres. This entry was posted in Morning Coffee on December 3, 2018 by omzzzzz.